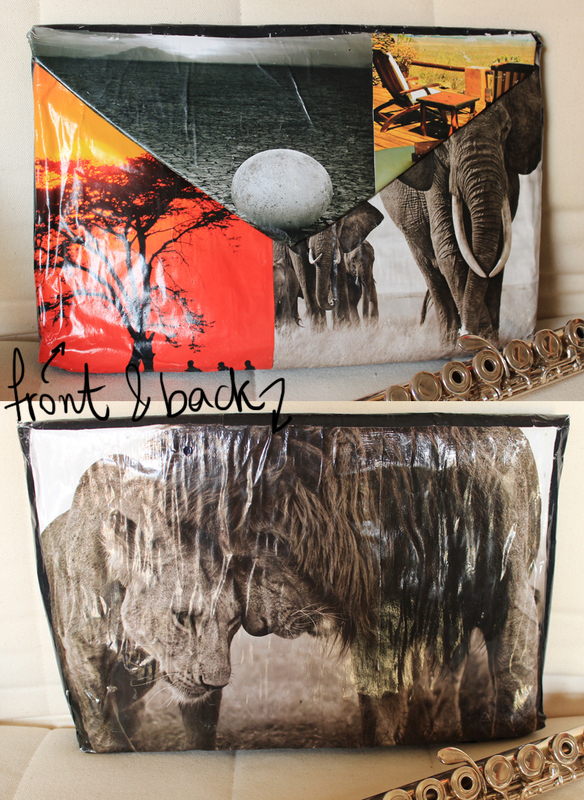 Remembering when I was telling you about using some Nick Brands' pictures to make a bag. Well they are two and here they are. Admittedly, the paper crafts are some of my favorites. I like their texture, their appearance, their making process, I like the whole package. 1. 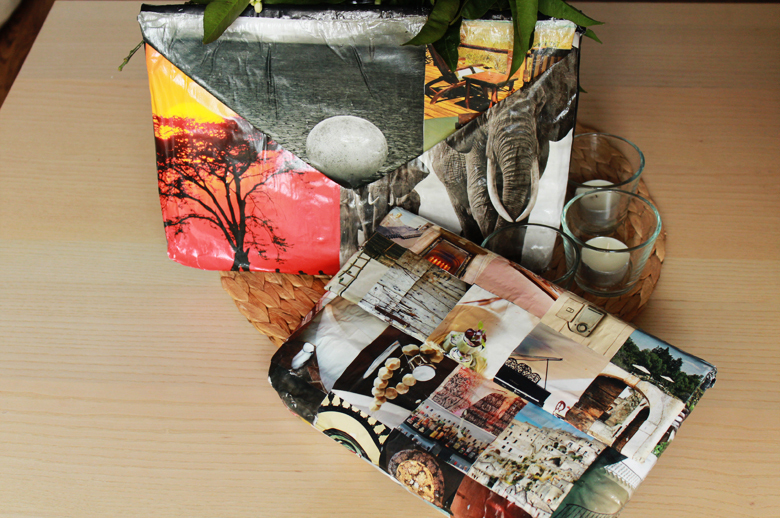 Begin by ripping out your favorite magazine pictures for your clutch. 2. If the bag's fabric is absorbent, cover the bag entirely with the plastic film so that the glue won't be able to contact the fabric. 3. Dissolve atlacoll in water at a ratio of 1:1 in the plastic container and then apply on the bag and start attaching the photos. 4. When dry, repeat with 2-3 more coats (allowing each one to dry before applying the next one), with special emphasis on the corners of the bag. Note: I found two bags and I couldn't resist collaging both of them. The smallest one turned out to be a better clutch, because of its more convenient size. However, I use both of them because they match with different types of clothes in my wardrobe. Also, a big concern of mine was, whether the corners of the bags would be easily worn out (paper is delicate you see). But, considering the fact that I did these bags back in September, with a little careful use (a.k.a. not slogging them here and there) their condition remains perfect. So we have a win-win here! So, here's the first one from a little closer. I love, love love, its colors. They are so earthy and vibrant in the same time. I match it with one-color mini dresses or with maxi ones, or whenever my outfit is a little romantic or back-in-the-90s. And here's the second one, the one with Nick Brand's photo. I adore its minimal look. This clutch is perfect when I go for total black looks. This and my black leather jacket are the best pals by now.